Our research suggests that consulting services are splitting into two distinct camps. High-value work is often associated with transformation and digital technologies, in which innovation and the ability to deliver tangible results are critical, while lowcost consulting focuses on providing services or products that clients would provide themselves if they had the capacity. Larger firms face significant challenges around fees, organisational structure, and operational flexibility as they try to manage both models simultaneously, but even niche firms aren’t immune to these new pressures. 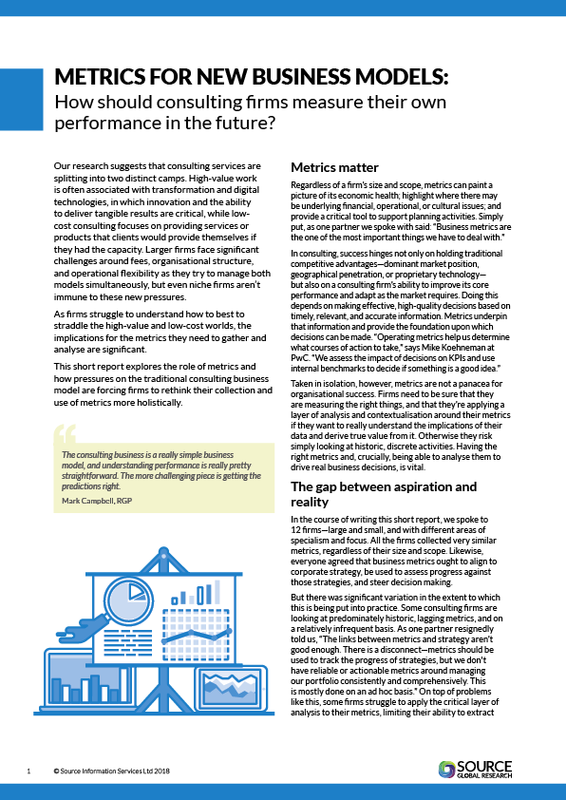 As firms struggle to understand how to best to straddle the high-value and low-cost worlds, the implications for the metrics they need to gather and analyse are significant. This short report explores the role of metrics and how pressures on the traditional consulting business model are forcing firms to rethink their collection and use of metrics more holistically. This report is free to registered users.